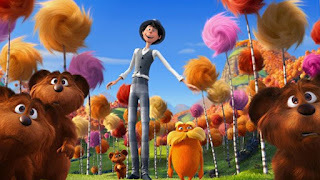 We took the girls to see Dr. Seuss' Lorax. This is one of my favourites from Dr. Seuss – perhaps my first introduction to inconclusive endings that will colour my pending like or dislike of Mass Effect 3 (oh look, I almost made it a day without mentioning it!) I was looking forward to this movie, but sadly, I ended up spending a lot of time trying to fall asleep. The sites gags were uninspired, the jokes were lame and the musical numbers were forced. I suppose it didn’t help that I wasn’t expecting this to be a musical, but once that was established, it was still unpleasantly surprising and a lot grating whenever they did break out into song and dance. Bunny and Panda (6 and 3) did enjoy the movie, though, and they got the heavy handed message and Panda was happily dancing along at the end, but I predict that this won’t be on their “Mommy can you buy us that!” list when it comes out on DVD. As far as Dr. Seuss books made into movies goes, I’ll stack this right at the bottom (which says a lot, since I didn’t even bother to watch Cat in the Hat.) Horton Hears a Who will remain at the top.